Posted in Bright Ideas / Research on February 13, 2019. Spam in Google My Business comes in many forms. While we know spam is a big concern of the local SEO elite, we wanted to know how the local marketers using BrightLocal were dealing with spammy GMB listings. 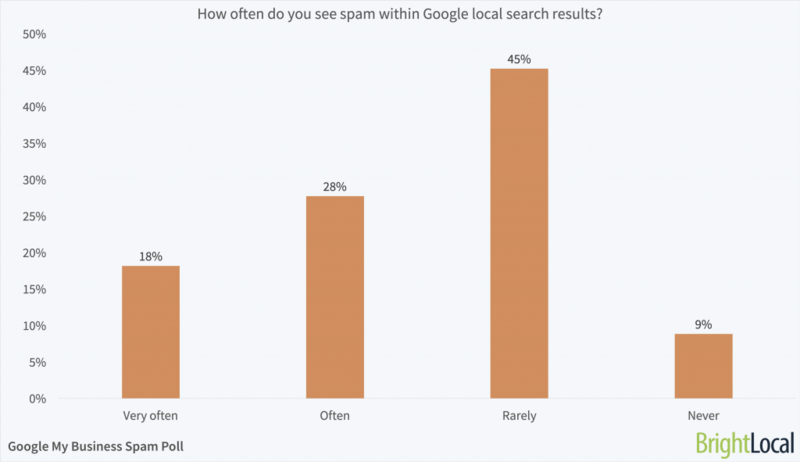 Ahead of our webinar, ‘How to Fight Spam and Influence Rankings‘, we asked BrightLocal users a series of questions around Google spam. Thank you to the 560 marketers who shared their insights. Note: In February 2019 Google announced they were retiring the Spam & Policy forum, and releasing a new way to report GMB spam. Read more on this here. How often do you see spam within Google local search results? Spam is common in local search results, and can risk pushing rule-abiding local businesses out of the 3-pack. Yet, only 46% of the marketers in this study see spam often or very often. Just 9% never see spam in local results. While marketers may not be seeing spam frequently, it’s definitely out there. Could those employing spammy tactics be getting more clever about hiding their tactics? Without doing your research into a business, it’s hard to know if they are gaming the system. Which types of spam have you seen? The above question was only shown to those who have seen Google My Business spam. Fake reviews are the most commonly seen type of spam, closely followed by keyword stuffed business names, and multiple listings for the same business. Fake businesses (businesses that don’t exist, and those created for lead-generation purposes) are also prevalent. Ineligible listings are also frequently seen, including businesses that aren’t currently in operation, and false addresses that make the business appear in a different location than it really is. While just 27% of marketers reported seeing these, it can be very hard to spot an ineligible business without the facts. Our Local Citations Trust Report found that 22% of consumers visited the wrong location for a business because the address was incorrect online. And, 80% of consumers lose trust in local businesses if they see incorrect or inconsistent contact details or business names online – making it all the more necessary for businesses to provide accurate information. 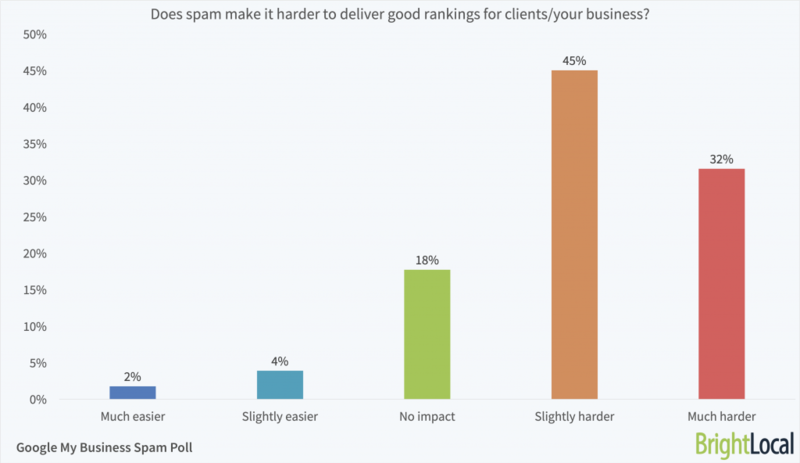 Does spam make it harder to deliver good rankings? The majority of marketers believe spam is making it more difficult for local businesses to achieve the top rankings. 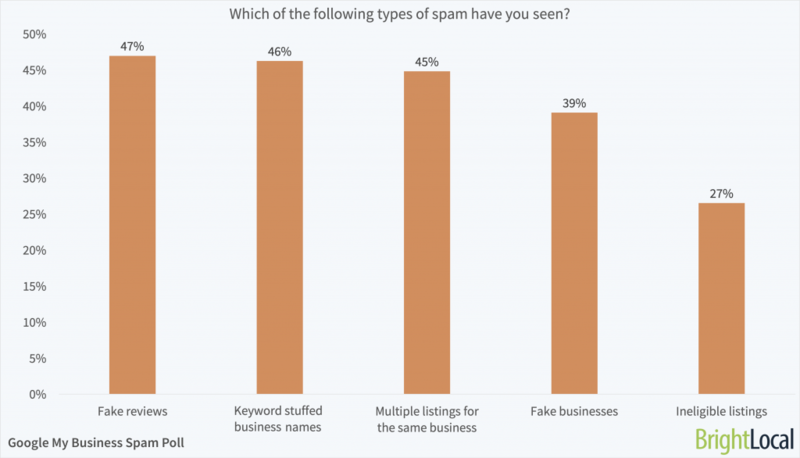 77% say Google My Business spam makes their job harder, with 32% from these saying it is much harder. Interestingly, 6% say spam makes it easier to achieve good rankings. This could be due to the relative simplicity of spam fighting compared to some other more arduous local SEO tactics. Sterling Sky’s great case study on keyword stuffing found that keyword stuffing led to a suspension from Google in 40% of cases – so it’s definitely worth following the rules! 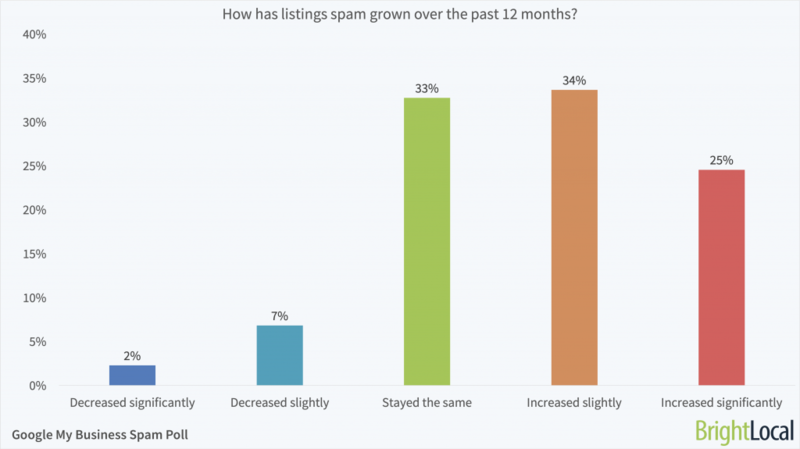 How has listings spam grown over the past 12 months? Spam in Google My Business listings has grown over the last year, with 59% of marketers saying they’ve seen an increase. A further 33% believe it has stayed the same. Yet, 9% believe spam has decreased. Could this be due to the efforts of spam fighters? Or, could spammers be getting better at hiding fake information in listings and reviews? Do you actively fight spam? With Google My Business spam affecting local businesses’ ranking possibilities, it’s great to see spam fighting becoming a normal part of the local marketing toolset. 66% of the local marketers in this poll are actively fighting spam for their clients or their businesses. 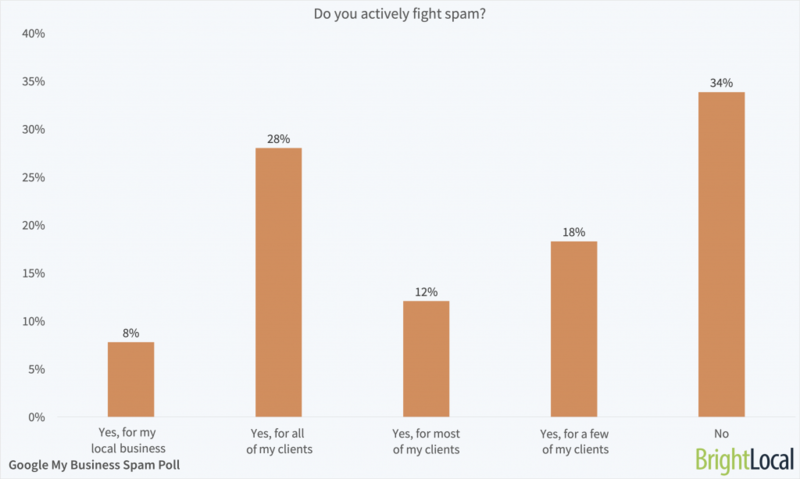 28% are fighting spam for every client. For top tips on spam fighting from Google Product Experts, Joy Hawkins, Ben Fisher, and Jason Brown, be sure to watch our webinar ‘How to Fight Spam and Influence Rankings‘, and read below to find out poll respondents’ insights into tackling spam in reviews and listings. Are you fighting Google My Business spam for your clients? Let us know in the comments below!